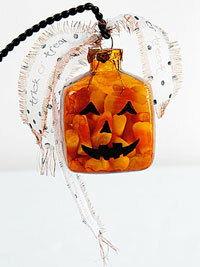 Here’s a quick and easy way to make fun treats for your Halloween party, from Jacquard Products. Make a whole bowl full or hang them on a dried branch! Personalize the ribbons! Paint the ornament by squirting some Calabaza Orange Pinata into a plastic palette and use a small sponge brush to dab it on the outside of the ornament (when filling with candy it’s best to leave the inside un-painted). Paint the metal cap as well. Work quickly, the Pinata Color dries fast. When the ornament is completely dry, squirt some Pearl Ex Black from the Re-inker into your palette and paint the Jack-o-Lantern face. Print the ExtravOrganza. Lay out a bunch of ribbons at the same time to make the best use of the ExtravOrganza sheet. It’s a good idea to print a test sheet using plain paper to check text size and spacing. Set the page layout to ‘landscape’ to create the longest length of ribbon then choose print settings for thicker paper and maximum flow of ink. I like to pump up the color saturation, especially if I’m printing colored text. Leave enough room at margins and between lines of text to allow for cutting and fringing. Load ExtravOrganza into your printer one sheet at a time, making sure to print on the fabric side of the sheet, and print. Cut the text ribbon, peel off the paper back and fringe the edges. Lay the text ribbon on a sheet of scrap paper and paint with Lumiere—Burnt Orange using a flat brush. It will dry fairly quickly and stick to the paper so lift your ribbon off before this happens. Add black polka dots to the ribbon with the Black Pearl-Ex Stamp Pad Re-inker. I squirted a bit out into a plastic palette and used a tiny round sponge to make my dots. Assemble the favor by carefully removing the metal cap from the ornament and filling with Candy Corn (or other yummy treat that will fit through the top). Tie ExtravOrganza ribbons to the top. Ta Da!!!! Cute little treats for your Halloween bash!